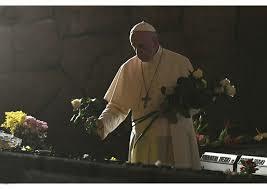 (Vatican Radio) Pope Francis visited the Ardeatine Caves Memorial on the Feast of All Souls to commemorate those who lost their lives in the horror of war. Rome’s Ardeatine Caves are the site of a 1944 massacre of 335 Italian civilian men and boys in revenge for an attack by resistance fighters who killed 33 members of a Nazi military police unit. The Pope spent some time in prayer at the Memorial and then gave a brief reflection. God of Abraham, of Isaac, God of Jacob: with this name, You presented Yourself to Moses when You revealed to him Your desire to free your people from the slavery of Egypt. God of Abraham, God of Isaac, and God of Jacob, God who binds Himself in a pact with humanity, God who binds Himself with a covenant of faithful love forever, merciful and compassionate to every man and every people suffering oppression. “I have observed the misery of my people, I have heard their cry, I know their sufferings.” God of the faces and names, God of each of the 335 men murdered here, on March 24, 1944, whose remains lie in these tombs. You, Lord, know their faces and their names: all, even those of the 12, who remain unknown to us. To You, no one is unknown. God of Jesus, our Father in Heaven: thanks to Him, the Risen Christ, we know that your name – God of Abraham, God of Isaac and God of Jacob – means You are not the God of the dead but of the living , that Your faithful covenant of love is stronger than death and is a guarantee of resurrection. O Lord, that in this place devoted to the memory of the fallen for freedom and justice we might put off the shackles of selfishness and indifference, and through the burning bush of this mausoleum, listen silently to Your name: God of Abraham, God of Isaac, God of Jacob, God of Jesus, God of the living. Amen.